What's new? Here's what's new. Here are some comparison shots of the game in the beginning and where it stands now. This week Einar made some aircraft models: A Vickers Wellington, and a Spitfire. 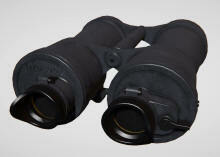 The models are made with low fidelity, because they will never be seen this close. Hello everyone! Here is a quick video showing some of the new texture work. Still working on the lighting. Hello everyone. Just writing to make sure you know we're still alive. I've been working on UI elements and menus, while Einar has been UV mapping the interior. None of these tasks screenshot particularly well, so that's why we haven't posted anything lately. Here is some footage of our new TDC model. When making it we tried to recreate the real thing as closely as we could without making the game unplayable. 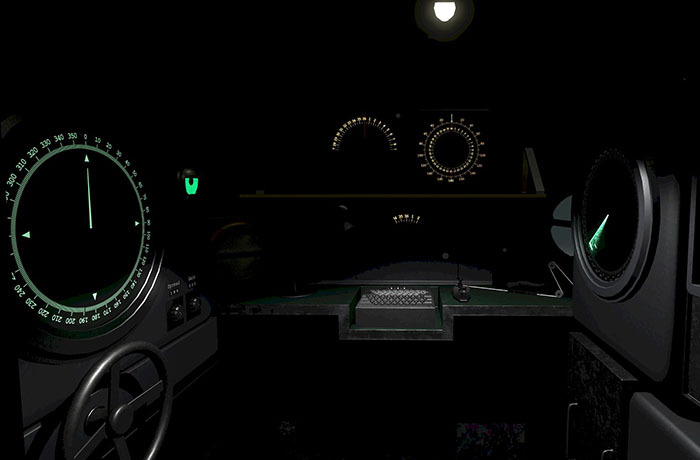 The right hand side knobs labeled angle tracking, single shot and salvo shot are placed under the map table in the real U boat, but we decided to move them to the TDC itself for for playability reasons. 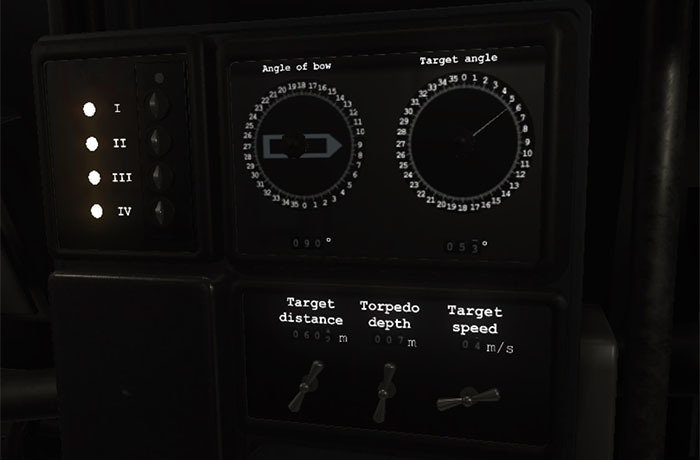 The torpedo status panel is also not real, in real life you have to ask the crew to count the torpedoes and to keep track of which tubes are loaded. We also added the time to impact module in the bottom right. We thought that it would be good game design to have some indication of how long the player has to wait until they know if they hit or missed the target. Control room and conning tower. 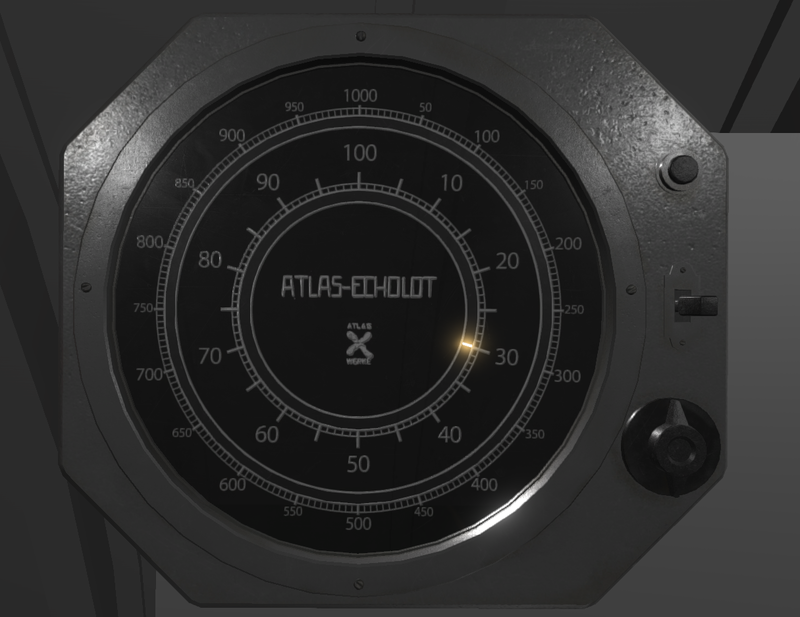 This week we have added some more detail to the control room and conning tower. 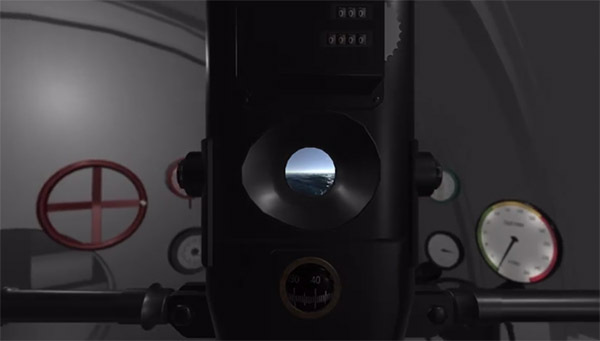 We also added rudder controls to the conning tower and bridge, as well as binoculars. The ships and planes are from Marulken, and will be replaced as new ones are made. 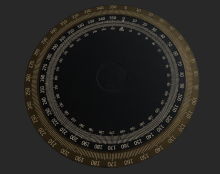 The outside compass face is also temporary. 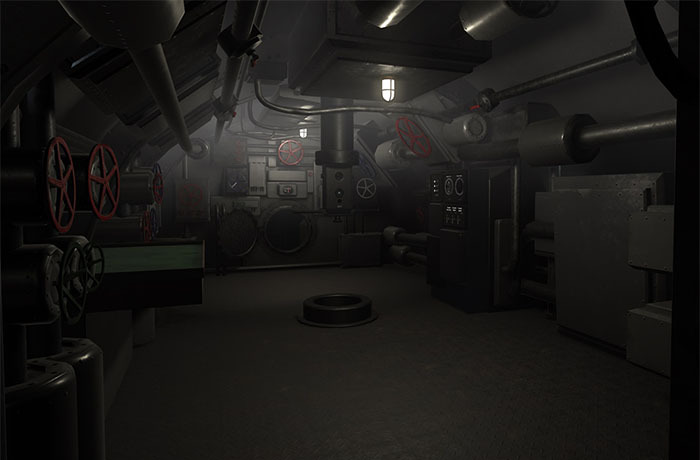 This week I have been working on the buoyancy and dive controls, while Einar has been adding more detail to the interior. 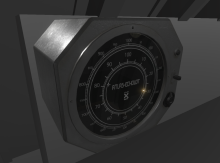 We made some new faces for the dive control meters, but the pappenberg and tilt meters are still temporary. Who wants to reshoe my horse? We think that immersion is a quality that a game like this must have to be enjoyable. Playing the game must feel like operating a u boat. You should feel like you are under water in a metal craft, and that getting detected by the enemy has serious consequences. While we do try our best to make the game as immersive as possible, we still value playability over realism. Realism and playability are not always at odds with each other. In some cases making the game more realistic actually increases the game’s playability, while also making it more fun and immersive to play. In other cases though, adding realism actively detracts from the gameplay experience by injecting needless busywork, unwinnable states, long periods of inactivity, random losses, and unbalanced enemies into the game. The reality is that as cool as u boats are, there is a lot of really boring moments on them in real life. 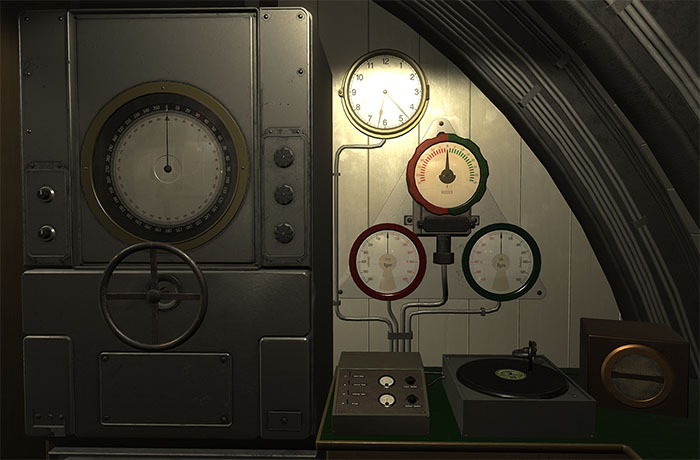 Most of a real u boat crew’s time is spent calibrating instruments, doing maintenance and waiting for orders. Many of the systems we have chosen not to model are redundancy systems that exist as a backup if something breaks. 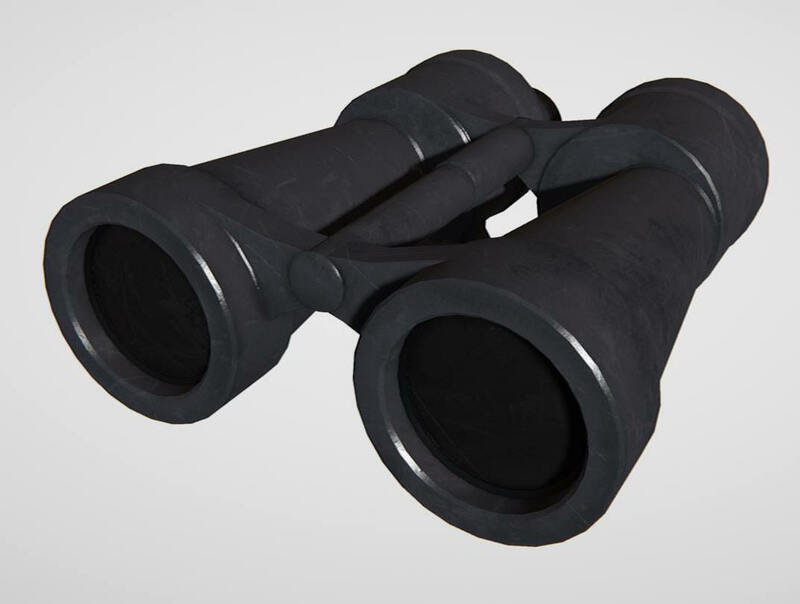 We have also removed a lot of tasks that are necessary to do in real life, but have no tactical value in a game. Then there is the question of difficulty. A professional baseball pitcher can throw a ball as fast as 45 meters per second. This gives the batter less than a 20 millisecond window of opportunity to hit the ball. In a game rendering at 60 frames per second, that is one frame of animation. This is obviously unreasonable, which is why all baseball video games have slower moving balls. I don’t want to dumb down our game so that anyone with two hands and half a brain can play it, but I also don’t want to make something that is completely unplayable to everyone except a small clique of super dedicated players. I want to find a middle ground, where the game is difficult but accessible. I want to make a game that encourages mastery, but does not require it in order to get started. So, to answer your question: We will try our best to make the game an immersive, cool experience, but we will prioritize systems that facilitate gameplay over those that hinder it. If I was playing a knight on a quest to save a princess, I would be pleasantly surprised if the developers had taken the time to learn about medieval armour and fighting styles, and tried to incorporate that into their game. I would not, however, appreciate having to re shoe my horse. Update: Last week we decided to try making the player avatar visible in first person view. It still needs some tuning, but I think we will keep it. Einar has started working on the interior. He will spend the following weeks making textures and models. I will continue implementing the remainder of the instrumentation. Update: Here are some new screenshots of the crew, including the fourth crewman! This week I have been reworking the torpedo data computer. The TDC in marulken was based on that of an american submarine. 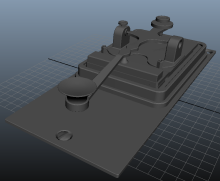 I have spent this week making sure the TDC for the game works like the German model found in the type VII. The most striking difference is that the German TDC does not have position tracking, which means that the solution you enter is not automatically updated over time. This is partially mitigated by the fact that the heading setting can be mapped to the periscope or UZO rotation, and that angle on bow value is slaved to the heading setting. 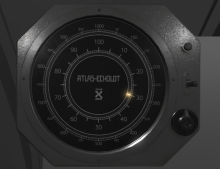 This means that as long as you track the target with the periscope, you only have to update the distance parameter manually. 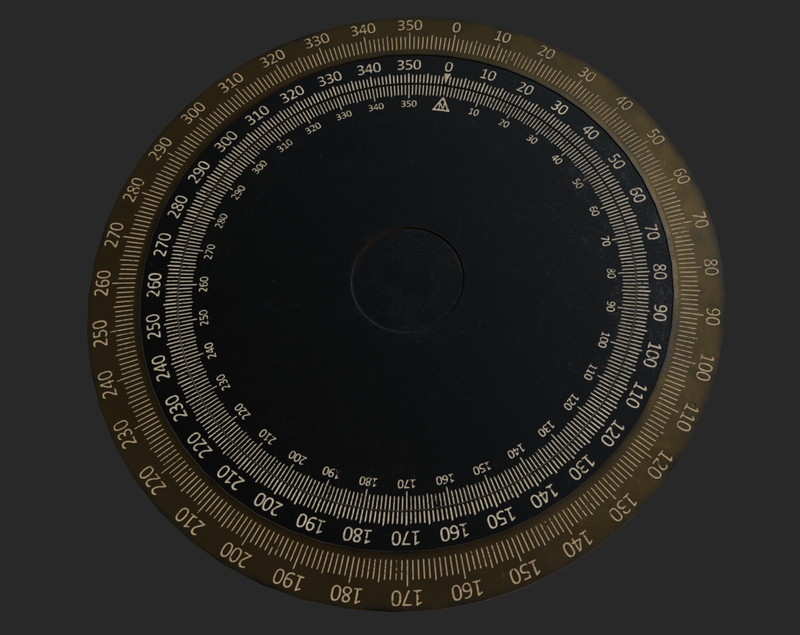 Einar has spent the week making the dial faces for the TDC, and has started making the new character models for the game. This week I completed my work on the TDC. It is not modelled yet, but we can now launch torpedoes from all five torpedo tubes, including the rear tube. The TDC can also calculate spread shots and solve the gyro angles for each torpedo depending on the target size and distance. Einar has modelled and textured the UZO binoculars and the echo ranger. The Pappenberg gauge and inclination meters have also been modelled, but they still lack textures. Next week I will write the scripts for the echo ranger and various other small things that aren't quite finished yet. Then I will start working on level streaming for the game. 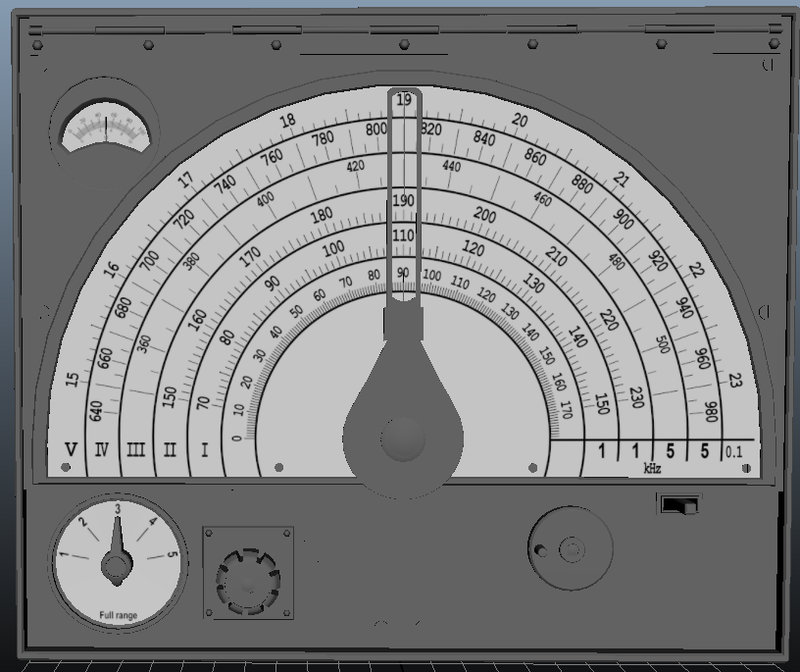 Einar will focus on texture work for various instruments that are not yet finished, such as the battery meter, various meters for the U-boat's pressure systems, etc. This week I intended to work on the TDC, but some other systems needed to be fixed in order to test it, so I have been working on various things like the periscopes and object position calculations in order to make something that is testable. 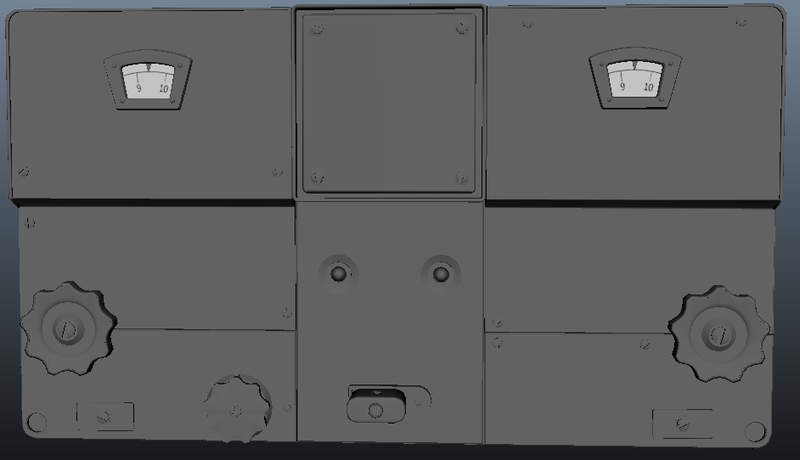 Einar has been working on the UV map and textures for the deck gun. The texture work is nearly done, and we will post some nice screenshots of it soon. Next week I will be working on the TDC again, while Einar continues to work with the deck gun and various other textures. This week I have been working on refining the buoyancy and drag calculations for the game. 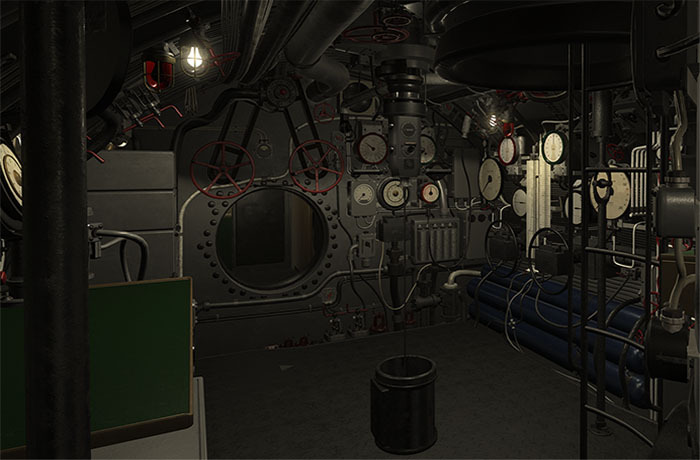 This is necessary, since the U-boat now has dive planes, trim tanks and buoyancy tanks that the player can control directly. Einar has spent the week working on the deck gun. Next week I will start working on the TDC. 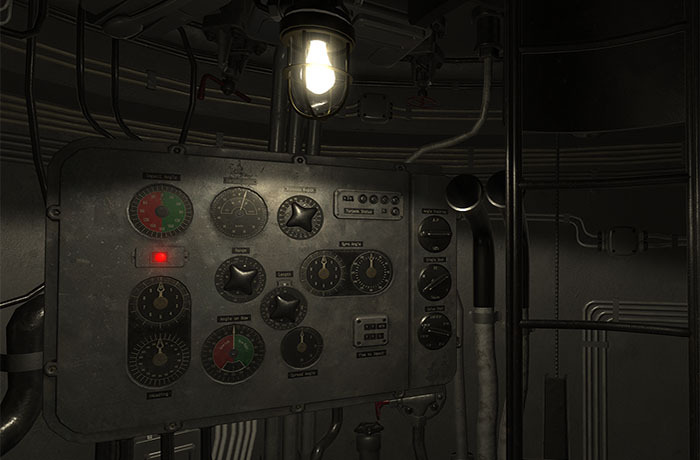 This week I have been working on various systems around the u-boat, making it slightly more interactive. I have made a mockup version of the torpedo data computer and the observation periscope engine (the little engine that drives the periscope up and down). I also added the instrumentation for the control room. The instruments do not do anything yet, but at least you can turn some of the knobs ;) . Einar finished modelling the hydrophone and the morse key. The next thing to model is the deck gun. Ahoy! Here is a quick development update! The new sub exterior is completely modeled, but lacks textures. We are currently working on the inside and the instrumentation. Einar has been busy making the instrumentation for the radio/sonar room, while I have been building the new systems for the propulsion and buoyancy. The next thing to be modeled is the hydrophone station. Oscar Wiberg and Einar Lundgren studied game design together at the Department of Computer and System Sciences at Stockholm University. Wolfpack grew out of HMS Marulken, their school project. SUBSIM has been online since 1997 and is the resource for all the news, reviews, tactics, mods, patches, forum discussions, custom missions, & playing tips for every naval game & subsim made, gathered together, to enhance the sim experience. Media wanting to cover Wolfpack? © 2017 Subsim. All rights reserved.